Max wants to make breakfast today, scrambled eggs. As always, I'm excited. It's not just scrambled eggs, it's an event. "How many eggs?" I ask. Three, Max says. His apron: the Lightning McQueen costume he's been living in since we got it for Halloween. I help him crack a few eggs into a bowl. He opens a drawer to get a spoon but has trouble grasping it so I grab one for him and wrap his fingers around it. We have spoons with foam tubing that are easier to hold but lately Max is all I want to use the same spoons you guys use, and so we let him. Heck, at least someone in this house wants to cook. Max starts stirring with gusto and yolk splatters onto the counter. "Slow it down, Max," I say, and he does. Pam spritzed on the skillet, I turn on the gas and when we hear a sizzling sound, I pour in the eggs. Max grabs a spatula and starts mixing, Dave standing guard. I get a little nervous with Max close to the hot stove, but Dave is diligent and Max himself is very aware that he needs to be careful. Scrambled eggs therapy is worth it. First, there's the fine-motor skill workout—grasping, stirring, scraping. Anything that gets Max's hands and fingers moving is A Good Thing. There's also the confidence factor; Max is always so proud when he's fixed food for himself. There's an independence factor, too; we're always trying to get Max to do things on his own—breaking the codependency isn't easy. So many activities are a struggle for him and he needs to know that, yes, he can do stuff on his own. And then, there's the miracle factor: Every single time I see this scene, and I mean every single time, I am awed. 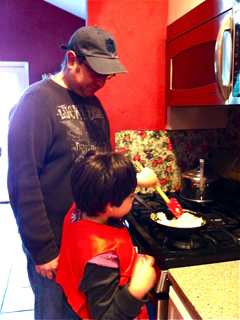 Watching Max make scrambled eggs is therapy for me, too, a reminder that he's come a long way from that time when the doctor at the hospital asked if we wanted to sign a Do Not Resuscitate. "Hey, Max, can I have some?" I ask, half-jokingly, because I know what he's going to say. "Noooooo! Mine!" he responds, smiling. Gotta work on the sharing thing. Once Eggs a la Max are done, Dave plops them onto a plate. "Eh-uh!" Max reminds me. I pluck the ketchup from the fridge and pour it on like a smiley face, and he happily digs in. And that is what we call a breakfast of champions at our house. Okay, fine. He's got the eggs down pat. Next up -- making coffee for mommy!! Ben just learned to zip up his coat on his own. We're lucky that we don't miss out on any of the accomplishments that others take for granted. Saw this comment re: disabled children on someone's facebook page. I'm beyond words, but I thought you might be able to put together a blog about it. Thank you for the much needed smile this morning :) You guys are the best! You're a very unselfish mother some mothers would have just made the eggs for their kids because it's too hard for them to watch their kids struggle. You're on the right track keep doing what you're doing Max will thank you for it someday. So great to see! It's amazing how the things we do on a daily basis can be such a great learning experience and accomplishment for our children that need the extra push. I love to see you give him the opportunity to participate in "life". This is how I plan to raise my daughter too, always to include her to the best of our abilities. I have high functioning autism and I like only the whites. 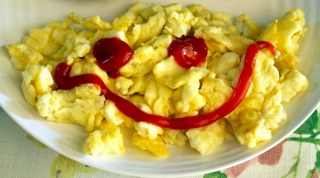 My mom would never let me have ketchup on my eggs, but it looks so good!